HONOLULU, HI – The Hawai‘i State Water Commission recently approved a mediated settlement that will immediately restore mauka to makai flows in the Waimea River on Kaua’i. Significantly for DHHL beneficiaries, it will provide the opportunity for a renewable energy project to be built on DHHL lands and for the first time since 1921, water from the Waimea River may be specifically set aside for Hawaiian homesteading on DHHL Waimea lands. 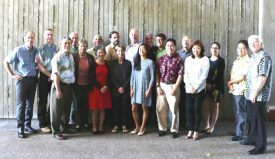 The Waimea Watershed Agreement, entered into by the Department, Po`ai Wai Ola/West Kaua`i Watershed Alliance (PWO), the State Agribusiness Development Corporation, the Kekaha Agriculture Association, and the Kaua`i Island Utility Cooperative (KIUC), arose from the Water Commission’s efforts to resolve issues related to PWO’s Petition to Amend the Interim Instream Flow Standard for the Waimea River and Complaint and Petition for a Declaratory Order Against Waste, as well as a Petition for a “Reservation” of water by DHHL for its Waimea lands. The Waimea Watershed Agreement advances the Department’s ongoing effort to implement its Water Policy Plan as well as to support several priority projects identified for the West Kaua`i region. Among other things, the Agreement also lays out an unprecedented opportunity for partnership between the Department and the KIUC, which if realized, will provide a reliable means to transmit water to its lands and will shift costs of rehabilitating, maintaining and improving key infrastructure from the Department to the KIUC. Under the Agreement, the Department also maintains the right to seek additional water reservations for full build out of its Waimea lands in the future. “We are pleased that this important step has been taken and we’ve come to agreement with the parties on the framework for the stewardship of land and water and responsible use of the resources in West Kaua`i. Should the proposed KIUC renewable energy project come to fruition, KIUC could increase its renewable portfolio by ten percent or more with pumped storage hydro, while supporting DHHL (Department of Hawaiian Homelands) and others in expanding agricultural, residential and economic opportunities on the west side,” said KIUC Chief Executive Officer David Bissell. The Department looks forward to working together to implement this historic agreement, most importantly with the people of Waimea and the rest of the Kaua`i Community. Back row from left: Doug Codiga, Commissioner William Balfour, Jr., Commissioner Neil Hannahs, Commissioner Michael Buck, Commissioner Kamana Beamer, Jeff Pearson, DHHL Deputy Director William Aila Jr., David Henkin, Jason Hines, Natasha Baldauf, Jonathan Scheuer, mediator Robbie Alm. How much land is contemplated for this hydroelectric project? The land that has been advertised for the hydroelectric project is about 14,559 acres because that land is held as a single parcel. However, only a very small portion of that total will be used for the project. Why is the department “disposing” of its Waimea lands for a hydroelectric project instead of awarding homesteads to people on the waiting list? “Disposing” does not mean that the land is being given away. It means that a lease may be awarded for a hydroelectric project if the Hawaiian Homes Commission determines it will benefit beneficiaries. The DHHL Waimea lands, is largely dry, remote, and steep. Less than one third of the parcel was once used for sugar cultivation and could be used for homestead leasing – if water and access can be provided. Most of the land is primarily unimproved with dirt roads and trails, many of which are difficult to use. Allowing the development of a hydroelectric project on a very small portion of the lands is a way to have another party develop road, electrical, and water infrastructure so that the land can be used by home land beneficiaries, including in homesteads. How will a hydroelectric project benefit DHHL and its beneficiaries? DHHL contemplates that the hydroelectric project will reliably and efficiently deliver water to its lands for the use of current pastoral lessees and for future homesteading as well as shift costs of rehabilitating, maintaining and improving key infrastructure from DHHL to the energy developer. The project may also generate revenue for future homestead development. The Department’s interest in leasing a portion of its Waimea lands for the development of hydroelectric project is based upon consultation with beneficiaries. The DHHL beneficiaries on Kaua’i themselves identified alternate energy development that is compatible with agriculture as a priority for these lands. The DHHL developed the West Kaua`i Regional Plan following an extensive regional planning process with its Waimea, Kekaha, and Hanapēpē beneficiaries. Throughout the plan process, beneficiaries expressed their desire to utilize lands for agricultural homestead purposes. Who will be reviewing these applications? Those reviewing submitted applications include DHHL staff, its agents and consultants. Why was this advertised in papers on Hawai`i Island?